The Federal Trade Commission has filed a federal court complaint against AT&T, charging that the company has misled millions of its smartphone customers by charging them for 'unlimited' data plans while reducing their data speeds, in some cases by nearly 90 percent. The FTC’s complaint alleges that the company failed to adequately disclose to its customers on unlimited data plans that, if they reach a certain amount of data use in a given billing cycle, AT&T reduces – or “throttles” – their data speeds to the point that many common mobile phone applications – like web browsing, GPS navigation and watching streaming video – become difficult or nearly impossible to use. According to the FTC’s complaint, AT&T’s marketing materials emphasized the “unlimited” amount of data that would be available to consumers who signed up for its unlimited plans. The complaint alleges that, even as unlimited plan consumers renewed their contracts, the company still failed to inform them of the throttling program. When customers canceled their contracts after being throttled, AT&T charged those customers early termination fees, which typically amount to hundreds of dollars. The FTC alleges that AT&T, despite its unequivocal promises of unlimited data, began throttling data speeds in 2011 for its unlimited data plan customers after they used as little as 2 gigabytes of data in a billing period. According to the complaint, the throttling program has been severe, often resulting in speed reductions of 80 to 90 percent for affected users. Thus far, according to the FTC, AT&T has throttled at least 3.5 million unique customers a total of more than 25 million times. According to the FTC’s complaint, consumers in AT&T focus groups strongly objected to the idea of a throttling program and felt “unlimited should mean unlimited.” AT&T documents also showed that the company received thousands of complaints about the slow data speeds under the throttling program. Some consumers quoted the definition of the word “unlimited,” while others called AT&T’s throttling program a “bait and switch.” Many consumers also complained about the effect the throttling program had on their ability to use GPS navigation, watch streaming videos, listen to streaming music and browse the web. The complaint charges that AT&T violated the FTC Act by changing the terms of customers’ unlimited data plans while those customers were still under contract, and by failing to adequately disclose the nature of the throttling program to consumers who renewed their unlimited data plans. FTC staff worked closely on this matter with the staff of the Federal Communications Commission. The Commission vote authorizing the staff to file the complaint was 5-0. The complaint was filed in the U.S. District Court for the Northern District of California, San Francisco Division. 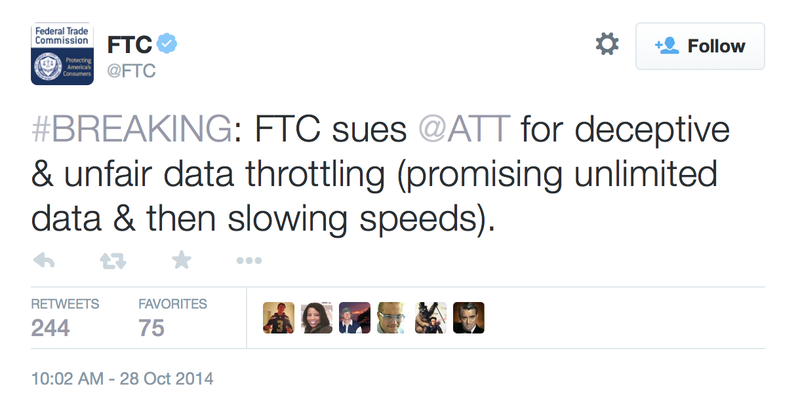 Have you suffered from AT&T's throttling practices? Let us know in the comments!